David welcomes Miranda Lewis to talk about the recent attack on the Westgate Mall by the al-Shabaab terrorist organization. 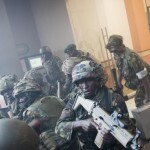 The attack lasted from September 21 to September 24 and resulted in at least 72 deaths, including 61 civilians, 6 Kenyan soldiers, and 5 attackers. Aside from being an American expat working and living in Nairobi, Miranda is also David’s daughter.